Have you ever left the grocery store balancing your bags in one hand while squinting at your receipt in the other? “What did I even get for all this money I spent?” you ask as you scan for big-ticket items to blame. Sometimes, food’s just expensive. Sometimes, you need to buy particular items that never go on sale. And sometimes, it’s all your fault. Don’t think you’re guilty of grocery-shopping self-sabotage? If you’re guilty of any of the six following mistakes, it’s time to make a few improvements to your shopping methods. This is grocery shopping 101, y’all. Did you seriously think you could walk into Piggly Wiggly unchecked and somehow waltz back to the car with only the necessities? You know that fancy olive bar lures you in you every time. You know that Sunday dinner you’re planning requires an oddly measured ingredient whose name you’ll probably forget. Stop trusting yourself to make good decisions on the fly! Making a list cuts down on the time you’ll spend crisscrossing the store trying to remember everything you need. Making a list also helps you stick to a budget, especially when you think ahead to deal-stack coupons and rebates. If you’re not making a grocery list — I don’t care if it’s on the fanciest notepad in the world or on the back of an old envelope — you’re not doing yourself any favors. Bigger is always better, right? Maybe, but it’s not always cheaper. Don’t blindly choose the largest can of coffee or bottle of detergent just because someone taught you once that buying in bulk will help you save. If the unit price isn’t listed, divide the price of the item by the number of ounces or other unit of measurement. You might find that the smaller item is a better buy, especially if the product is on sale. The cashier shakes her head, the customer grumbles and I try to be supportive, but this is also grocery 101. If you see a big, flashy “two for whatever” sale tag, check for fine print. Some stores will specify the price of purchasing just one item; others will remind you to pick up two in order to get the deal. It’s so easy to be tempted by coupons, especially those that save you a dollar or more on items you’ve already got on your grocery list. Clip those coupons, sure, but take a closer look when you get to the store. If the brand-name price is still higher than the generic version after the coupon is applied, reconsider: Do you really need that particular brand? On the flip side, you can’t always rely on the store brand to provide the best value. Between store circulars, members-only discounts, coupons and cash-back apps, it’s easy to lower the price of name-brand items. Sometimes, you’ll need to stack your deals for the “fancy” item to be the best value. But sometimes, you’ll just get lucky. At least a third of the time, I get to the front door of the grocery store and realize (usually with entirely too much anguished song and dance) that I forgot my reusable bags. In many places around the country, you’ll pay a fee for each disposable bag you take away from the grocery store. If you’re just grabbing a few things, it’s no big deal — you’ll work on your milk-eggs-bread juggling act on your way home. But if this is your regular, full-list grocery run, that extra $0.05 or $0.10 per bag adds up quickly. Plus, it’s good for the environment: Make taking your own bags a part of your grocery routine. Maybe store your list-in-progress inside one of your reusable bags. And don’t even play me on having to pay for reusable bags. Have you never been to a community event with giveaways? I challenge you to see how many free reuseable tote bags you can find in your own neighborhood. Have we all learned our lessons? OK. Let’s try this again. 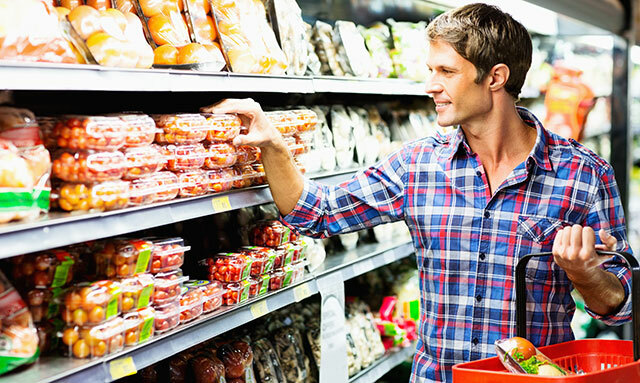 Your Turn: What embarrassing grocery-shopping mistakes have you finally learned not to make? Lisa Rowan is a writer and producer for the Penny Hoarder. She lives in Washington, D.C., where the grocery stores are always crowded. Always.